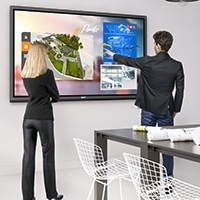 The BenQ SX912 is the brightest choice for all your meetings. 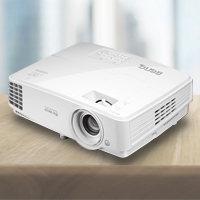 Light and compact with 5000 ANSI lumen brightness and 11000:1 high contrast ratio, the SX912 offers a superior viewing experience even in well-lit rooms. It doesn't matter where you are, with 5000 ANSI lumen high brightness, the SX912 will always give you the best clarity under the brightest lights! So, take advantage! Stay in control and enjoy perfect presentations and the best interactions with your audience! The SX912 comes with XGA native resolution up to 1024 x 768. This brings you crisp and accurate images in your every presentation! Featuring a high contrast ratio of 11000:1, the SX912 translates image with razor-sharp details defined by a broader range of subtle color differences. As a result, the image is sharper, cleaner and easier to read. 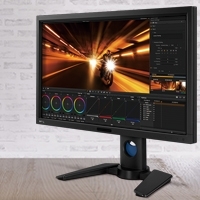 BenQ's exclusive 3D color management tool ensures 100% uncompromised color customization with the freedom to independently fine-tune the hue, grain and saturation levels of all six primary colors (R/G/B/C/M/Y). BenQ SX912 is built with latest DLP® technology to support 3D functionality, allowing schools to bring an immersive learning experience to their students with a simple preparation of 3D glasses and 3D content from your blu-ray player. SX912 1.5x big zoom feature opens up space with an impressively wide range of throw distances. All you have to do is simply place the new projector right where your original ceiling mount is. Without adding projector setting re-construction costs to your budget list, you'll get to save the money for better use. LAN Control enables IT managers perform day-to-day projector maintenance and repair tasks efficiently and effectively – offering them full access and control over every projector directly from their workstations. The SX912 offers seamless support for the Crestron and PJ-Link Control system. The upper lamp door is designed for IT managers to replace the projector lamp safely and quickly. should the projector lamp go out in the middle of the class, it can be replaced without delaying the class. BenQ's unique projector engine cooling system is optimized to operate the projector at a controlled temperature to ensure reliable projection performance each and every time. The minimized risks of heat damage to sensitive internal components greatly help cut down maintenance and repair costs. ecoFACTS can tell you how eco-friendly BenQ products are! Development of eco-friendly products, BenQ doesn't just want to comply with green regulations passively, but also to actively develop eco-friendly products! ecoFACTS declares BenQ's greatest efforts on the replacement of hazardous substances, material selection, packaging design, energy-saving design and other aspects of the products. Image Size (Diagonal) 28" ~ 300"
Subject to the terms and conditions set forth below, BenQ America Corp. ("BenQ") warrants the BenQ Digital Projector ("Product") you have purchased from a BenQ authorized reseller on or after May 1, 2010 in the United States to be free from defects in materials or workmanship under normal consumer use during the warranty period in the continental United States, Hawaii, and Alaska. If the Product becomes defective during the warranty period BenQ will, at its option, repair or replace the Product. BenQ may use new or reconditioned components or parts to repair the Product, or replace the Product with a new or reconditioned Product of the same or functionally equivalent model.  Three (3) year from the purchase date by the original retail purchaser (the "Customer") (except for pre-installed lamps as specified below and refurbished units which have a separate warranty policy), parts and labor only (No advance replacement).  Pre-installed Lamp Warranty: Pre-installed lamp is guaranteed 1 year or 2000 hours from the purchase date by the Customer, whichever comes first.  Return Merchandise Authorization Shipping: The Customer will pay shipping freight to BenQ or a BenQ Authorized Service Provider and BenQ will pay shipping freight to the Customer during the warranty period.  DOA (Dead On Arrival): Must be reported within thirty (30) days of purchase. An RMA number must be issued in order to process the replacement. BenQ will replace the DOA unit with a brand new replacement. BenQ will cover the freight charges both ways.  Shipping Damages: All shipping damages must be reported within seven (7) business days upon receipt of the Product. BenQ is not responsible for the shipping damages reported after such period.  Repaired or Replaced Parts and Products: All repaired or replaced parts or products shall be warranted only for the remainder of the original warranty period specified above. installation of third-party products; (h) improper environment (including improper temperature or humidity); (i) unusual physical or electrical stress or interference, failure or fluctuation of electrical power, lightning, static electricity, fire, or acts of God. BenQ is not responsible for damage to or loss of any programs, data or removable storage media. You are responsible for saving (backing up) any programs, data or removable storage media.